Kansas City Wizards ownership group OnGoal, LLC announced Tuesday that approval has been granted for a state-of-the-art soccer-centric stadium for the Wizards and a nearby youth-soccer complex. Construction is set to begin tomorrow at the stadium site, located across from Nebraska Furniture Mart and The Legends in the Village West district of Kansas City, Kansas. The Wizards, a founding member of Major League Soccer (MLS), will become the first Major League professional sports team to play its home games in the State of Kansas and the 12th MLS team to play in a venue built for specifically for soccer. 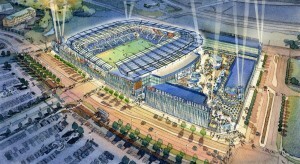 Kansas City is preparing for its 15th MLS season, with the League expanding to include 16 teams. The Wizards stadium is part of a larger $400+ million project developed by OnGoal and LANE4 Property Group that will help fulfill the initial vision of the Village West project. Additions will include a world-class tournament field complex with 18-24 fields for major youth sporting events and an office complex for Cerner Corporation expansion. The soccer facilities are projected to host more than 300 event dates with over 800 events annually, drawing more than 2.5 million attendees to the area. The Wizards stadium would also play host to concerts, international soccer matches, American football games, rugby matches, lacrosse games, field hockey events and more. The field complex would be an attractive host to major national and regional soccer tournaments due to Kansas City’s central location in the United States and the surrounding development at Village West. The complex will also host other tournaments and sporting events for men, women and children and in multiple sports.